This problem is especially exacerbated on the occasional “double Shabbat.” We are having some of those lately, when a Feast Day is right before or after a weekly Sabbath. To fix this dilemma I decided that for some Sabbaths, we would just use paper products that we can throw away. We don’t do this every Sabbath, but most. Also, I know it costs a little money and isn’t very “green,” but well, that’s not what this post is about. I’m okay with those two things at this time. So, each Friday afternoon, after I emptied the dishwasher for the last time, I’d set out the paper products on the counter and tell the kids to start using them instead of the regular dishes and silverware. And the dirty dishes problem went down dramatically! 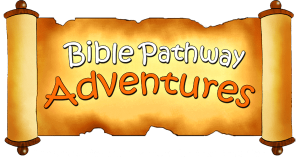 You may do this only on those “double sabbaths,” or just the ones you’re very tired, or have Sunday plans, or whenever you want faster clean up and a more tidy kitchen. But, I did notice a couple problems. First, sometimes I forgot some of the paper products-usually the silverware. Sometimes, it was the cups. But nearly every Shabbat, I forgot to put something on the counter, because I didn’t keep all the paper products in the same place. We do a lot of “grazing” eating in my home over Sabbath, so the kids often help themselves. Thus, if the cups or silverware or whatever aren’t on the counter in the pile of paper products, they get the real thing. Then, at the end of Shabbat, I’d clean up and end up with a load of silverware for the dishwasher, but nothing else. Or I’d have only cups to load and nothing else. And you all know how that sets off the perfect balance of having equal numbers of items in the dishwasher. Oh, I hate that! I call it the Kitchen Saver Basket. So, I realized I need to keep all the paper products together in a basket of some sort. Now, on Friday I just take out the basket of paper products and put it on the counter. Easy, peasy! I call it the Kitchen Saver Basket. I only put in about what I think we need for the day, which saves counter space because I used to have to put out the whole package of plastic cups, for example. 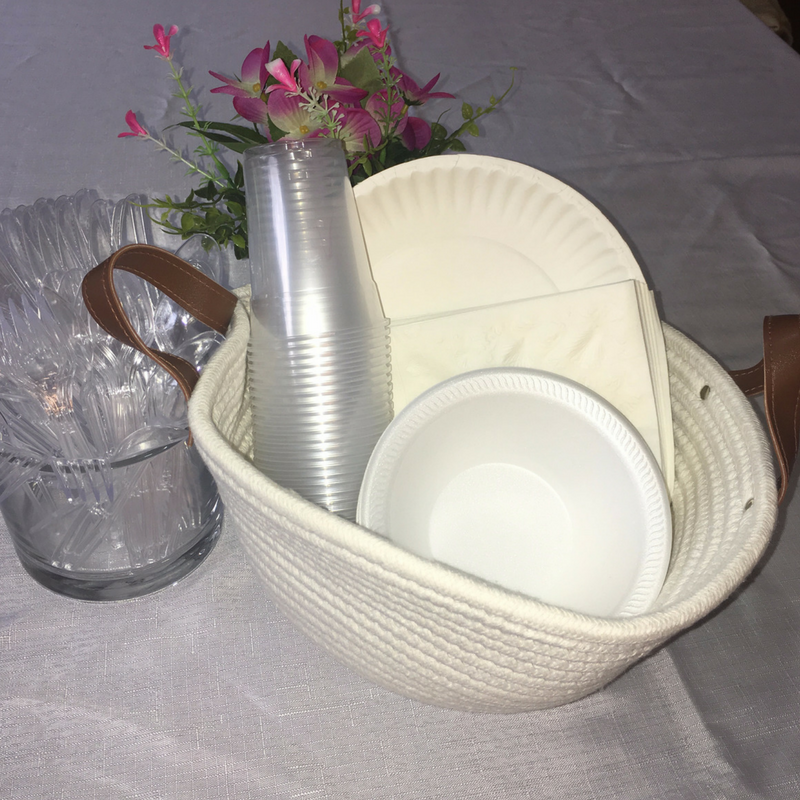 Now, the basket just holds some cups and some of each item. I went to Dollar General today to get some different kinds of baskets so I could take pictures and show you some variations. I like the black one best for my family. The plastic silverware is inside a short little vase, also from Dollar General. 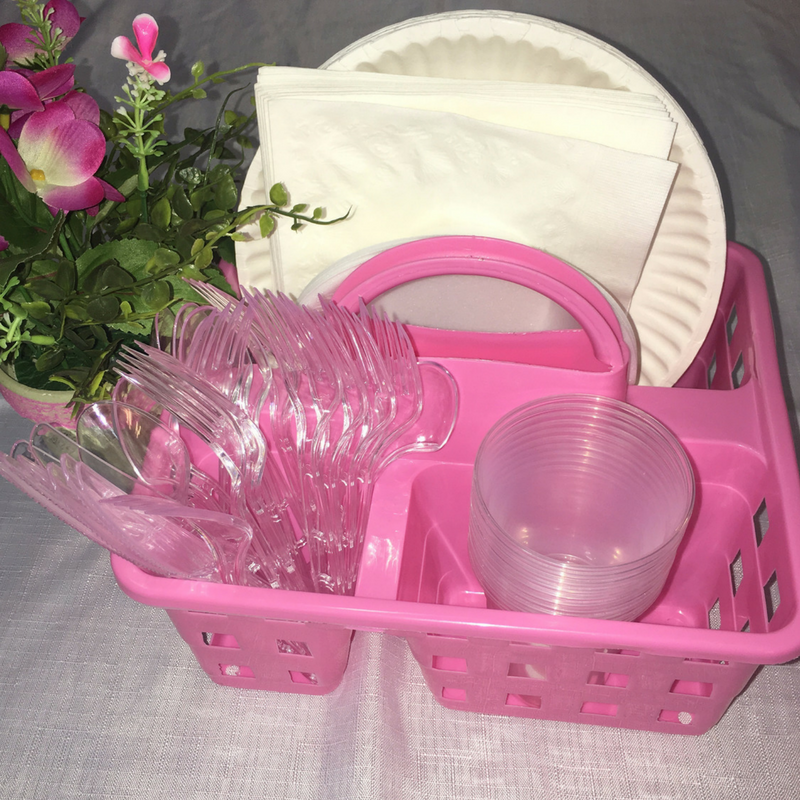 The second little problem I had, though, was that my kids would just plain totally forget that the Kitchen Saver Basket was there and they would go get regular silverware or plates to use. I even forgot often! To fix this problem, I have this new little idea. I’m going to start putting these little printables on the knobs of the silverware drawer and the cupboards where the plates and cups are kept. They will be a reminder not to use the real stuff. You can see what these look like in the pictures, AND you can download them for free and use them yourself. 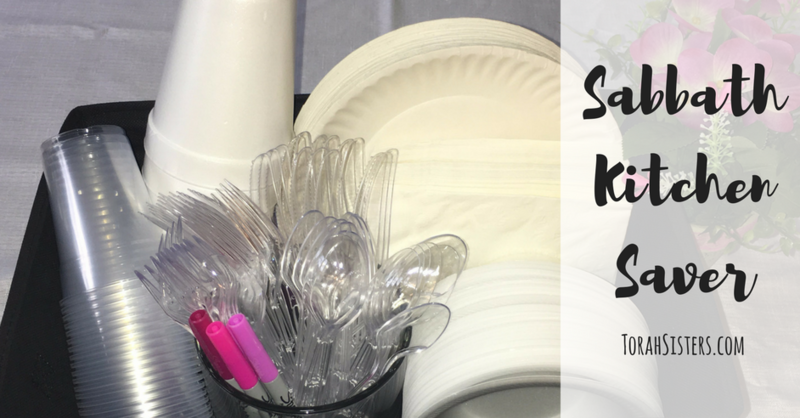 Click here to get these Kitchen Saver Kit printables free. When I’m cleaning up Saturday night, I just take the tags down and store them in the Kitchen Saver Basket until the next Prep Day. I’m sure there are other ways to remind your family not to use the real stuff. Put a ribbon across the cupboards or something? Leave a comment with your idea! 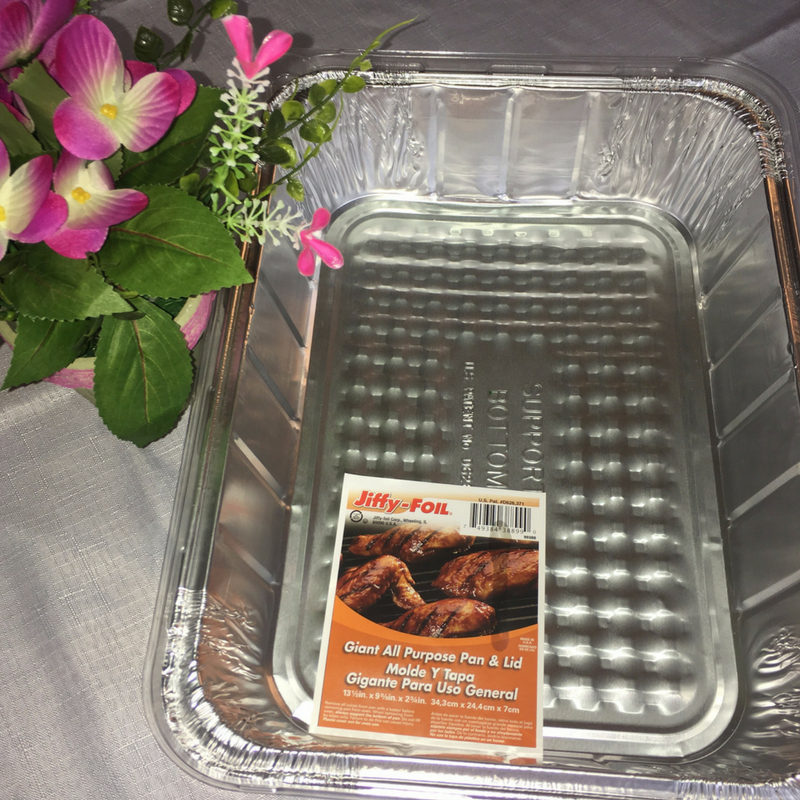 You’ll still have some food prep dishes, like the casserole dish, or whatever. Again, if you don’t mind spending a little money, you can buy disposable cooking containers of all kinds of stores, even the dollar store. I got this one at Dollar General for very little money. I should add that I made room in a cupboard for the basket, and I mean the whole kit with the contents. I don’t repack it every Prep Day, I just “top it off,” Yes, it was bit of a pain to find room for it, but it’s worth it. I could also store it in a linen closet during the week. But I will not keep it on the counter all week, or it loses it’s effectiveness, and clutters the counter. So, I have the basket stored fully stocked, and I also have extra paper products in the cupboard. Leave comments with your ideas! What other ideas do you have? Leave a comment with your tips and ideas! But please, don’t debate whether or not it’s okay to wash dishes on Sabbath. 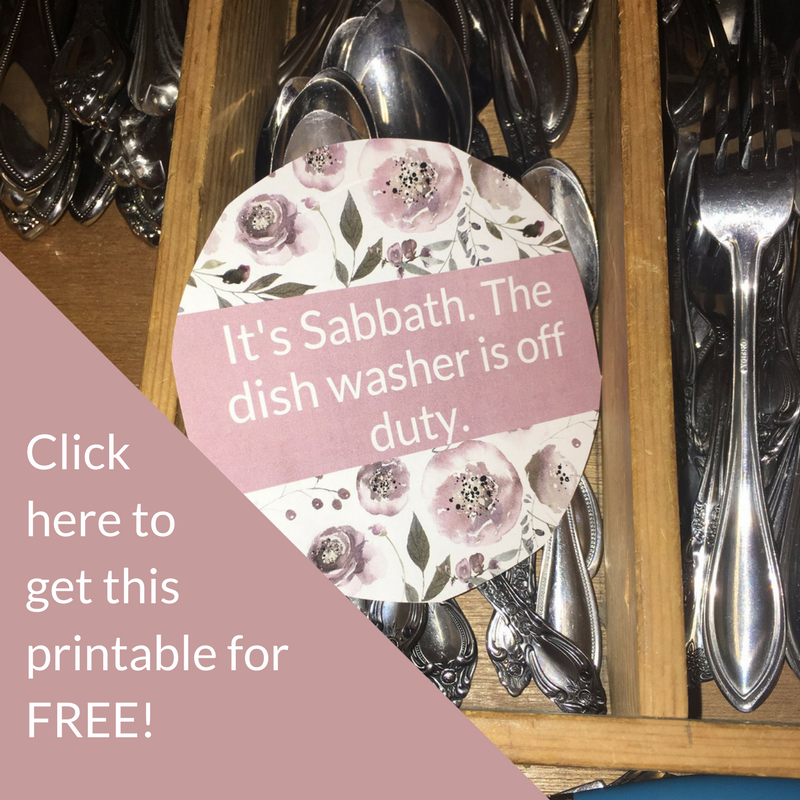 This post is for those who prefer not to do dishes on Sabbath, so let’s just talk on this post about this topic. Thank you! I also know this method costs a little money and isn’t very good for the environment, so feel free to post your tips on making those things better while still being able to use disposable. Are there ways to reduce cost and waste, yet still throw away? I love it!! Kudos to you for a creative solution!! Love this idea!!! I al aye dread the dishes piling up in the sink! I buy the decorative paper plates from dollar tree. That way it still has the appearance of fancy, but can easily go in the trash afterwards! 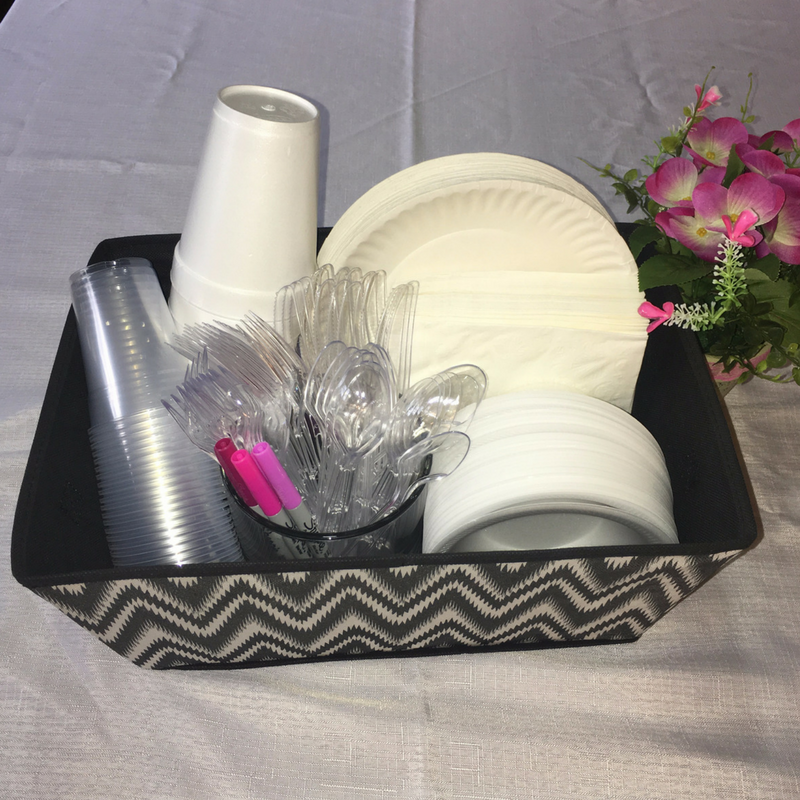 Idea for helping with the environmental impact, use compostable items they are a little more money up front but can be put into a compost and used for your garden or flower beds. I love this idea and will be implementing it! lol…okay….I’m definitely the odd one here…..I live in a barn, I installed a restaurant kitchen sink at the remodel, (which holds a LOT of dirty dishes!) and I l love having a large pile of dishes to wash!! I cook a lot, and usually wash up as I go, but sometimes not. I hand wash only…I nixed the idea of installing a dishwasher. I love the idea tho of the basket and the reminders tho. Beautiful. What a wonderful idea! Doing this today! For those that don’t want paper, they make a very pretty Disposable Plastic Plates. After we started keeping Shabbath, I found these plates and it made everyone happy. 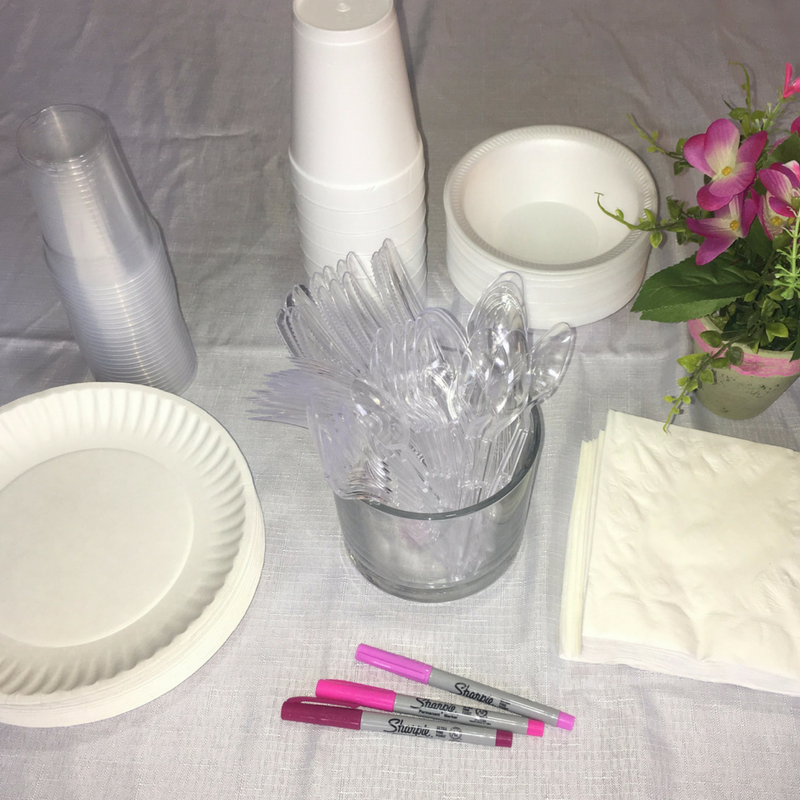 I only use them for actual meals, they use paper for snacking, etc.. We go back & forth with the plastic forks, but when I don’t have them, I have a large soup cup, I I put a little soapy water in & leave in the corner of the sink for the silverware to be put neatly into.